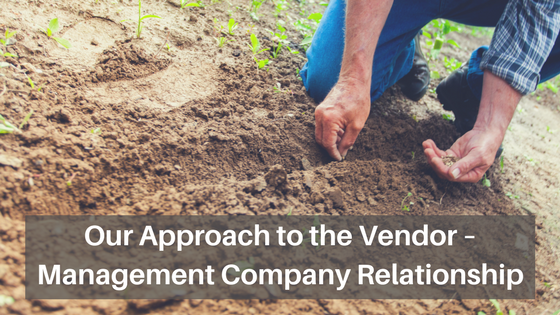 At Walters Management, our unique approach to the vendor – management relationship sets us apart from other companies. Selecting which vendors to work with is a joint effort between our clients and managers. With this model, we are able to maintain a high level of professionalism and trust between everyone involved. How are vendors awarded accounts or projects? A large part of what sets Walters’ vendor process apart from other management companies, is that we do not have a material interest in ancillary services, nor do we require our managers and associations to work with a predetermined list of contracted vendors. When working with new associations, they are given the choice to continue working with their current vendors, or going out to bid if they feel a change is needed. For particular projects where the board does not already have a preferred service provider, we are happy to forge new relationships with our board members and vendors. This approach ensures each association is able to use the best candidate for individual projects, budget, and community- specific needs. How are vendors qualified to work with associations Walters manages? Many of our vendor relationships start within professional organizations such as CAI® or CACM®. Vendors who are members of these organizations are not only aware of the specific needs of community associations but they are also held to certain industry specific standards. As a management company that only wants the best for our clients, we will work with any industry professional that the Board would like as long as insurance, appropriate licensing, and references are verified. What is the protocol for working relationships between Walters and vendors? First and foremost, each contract executed is strictly with the association, not Walters Management. Our role is to monitor service providers’ performance and make certain that they adhere to the terms of their contract. In addition, we confirm that all licensing, insurance, and tax information is current on an annual basis. A system of checks and balances is in place at all levels. An example of this is that every check over $1,000 requires two signatures, generally provided by our Senior Vice Presidents. This is all done to protect our clients and to work in their best interest at all times. Being impartial during the vendor selection process while ensuring that our community associations are receiving the best services available is very important at Walters. We have established a company-wide set of practices that allow us to hold all managers accountable and to act in the best interest of our clients.